Rumacure capsules and oil are most effective and fast-acting anti-arthritic formula which curbs progression of disorder and reverses its damaging effects substantially. Arthritis has many forms. There are over 100 different forms of arthritis known so far. All of these make joints stiff, painful, inflamed and immobile. Rumacure capsules and oil not only relieve symptoms of the problem in victims but protect and reverse the damages to provide relief. These are capable of preventing other diseases and disorders as well which deplete bone strength, flexibility and density and make entire musculoskeletal system weak and fragile and restrict joint movement. These herbal supplements are natural cures for many types of depressing pains like sciatica, lumbago and cervical spondylitis as well due to their wide ranging benefits and abilities to improve joint mechanism and muscular strength and bone health. Promote joint movement in a short time. Curbs diseases like arthritis and debilitating disorders like osteoporosis to maintain healthy joints and bones. Improve health, energy levels and strength of muscles, ligaments, tendons and bursaes to keep joints pain-free and mobile. Curb all sorts of joint pain occurring due to diseases or disorders, or due to injuries, trauma, over-use, etc. Repair damaged cartilages to promote joint movement. Improve bone density and flexibility by supplementing vital nutrients. Ensure absorption of nutrients for strong musculoskeletal system. Improve immunity and alleviate auto-immune disorder. Improve digestive functions, prevent excessive uric acid formation and dissolve its crystals. Stimulate nerves and improve functions of nervous system to prevent neuralgic pains and problems like fibromyalgia. Provide higher joint stability by providing healthy joint organs and improved nerve functions. Extremely beneficial for aged individuals, women, people in sitting jobs and leading strenuous lifestyle. Provides pain relief and diffuses swelling in a short time. Promotes joint movement by curing stiffness and weakness. Enhances nutrition supply to muscles, ligaments, tendons and heals swelling and damages caused to them. Treats tenderness, redness and warmth in joints effectively. Speeds-up process of cartilage, muscle and ligament repair. Improves functions of nerves and enhances reach of immune system to treat infections. Very useful in relieving lumbago, sciatica, cervical and other types of joint pains. Increases range of motion and joint endurance considerably in a short time. Fights back ill-effects of all type of arthritis, aging and bone disorders. 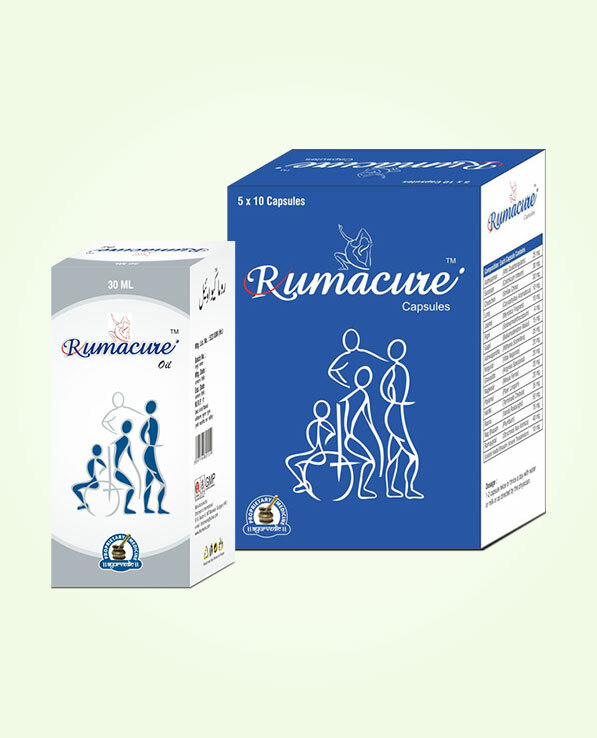 Rumacure capsules possess herbs like Asthisanghar, Suranjan, Guggul, Nirgundi, Ashwagandha, Jaiphal, Rasna, Rigni, etc. These herbs supplement calcium and vitamin C to remove calcium deficiency from the body and prevent bone atrophy due to it. 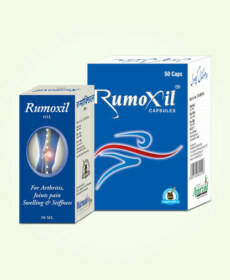 These enhance flow of blood towards joints and within joints which gets depleted due to aging, injuries and swellings. Diffuse swelling due to their powerful anti-inflammatory properties and relax blood vessels to allow optimum blood flow. Enhance nutrition supply and oxygen to organs of the joints and also improve efficacy of immune system to curb infections. This ayurvedic treatment for arthritis joint pain possesses herbal ingredients which prevent formation of harmful acids like uric acid and also lower toxin presence in blood. These capsules increase blood’s nutrient carrying capacity as well and enhance health and endurance of joints in a short time. These curb auto-immune disorders and improve nerve functions to prevent rheumatoid arthritis, fibromyalgia, neuralgia, etc. effectively. 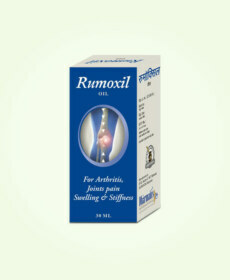 Rumacure oil possesses herbs which seep through skin and affect deep lying organs of the joint. This oil diffuses swelling and curbs pain to promote movement. On regular use it strengthens bones, muscles, ligaments and tendons of the joint to increase range of motion, endurance and strength of joints. This is effective in curbing pain, swelling and stiffness in joints due to arthritis or bone disorders like osteoporosis. Rumacure oil also prevents ill-effects of calcium deficiency and prevents joint debility. Rumacure oil possesses herbal ingredients like Kapur oil, Buleylu oil, Gandhapurna oil, Dalchini oil, Castor oil and Tarpin oil. These oils seep through skin pores and stimulate nerve functions; healthier energized nerves prevent pain and provide joint stability. These cure many types of pains like sciatica and also numbness in limbs due to constricted nerves. This oil relaxes muscles and also blood vessels for smooth flow of blood and relief in pain and discomfort. Using Rumacure capsules and oil is very easy and simple. One should consume one or two pills of capsules every day twice, once after breakfast and another after dinner with water regularly for 3 to 4 months. Take 8-10 drops of Rumacure oil and apply over affected joint in the form of a layer, gently massage the joint till entire oil gets absorbed in the skin. Repeat 2 to 3 times in a day. These herbal supplements are completely safe and do not cause any side effects, even if you use them for prolonged use. These are safe even for healthy individuals who are prone to suffer with joint problems due to strenuous lifestyle, lethargic lifestyle, obesity, arthritis or other disorders like diabetes. Arthritic pain and swelling can restrict you to bed. I was facing severe symptoms of the disorder and my state was miserable. NSAIDs and other kinds of medicines were mere pain-relievers for a short period and were failing to provide relief. I started using these supplements and in short period could feel the difference. These supplements improved my joint motion and relieved pain and swelling to let me perform my daily tasks. Now I am active and agile and hopeful of leading a normal life.